A clinical therapist is the creator of THE GRATITUDE RING…..I AM GRATEFUL FOR…™ The ring uniquely combines awareness and action to train your brain to think positive and be grateful. Now, with the suggestion of a passionate pet person, a new dimension has been added which will appeal to animal lovers. 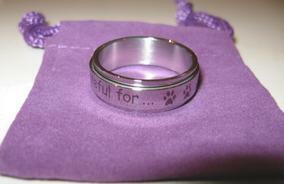 THE PAWPRINTS GRATITUDE RING: The ring with the addition of animal pawprints also increases positive thinking and feelings of well being. Beautifully packaged in a purple velvet pouch, the ring is the perfect gift, trophy, raffle and auction item to give people the gift of well being. What could be more special than thinking about your precious pet and being grateful for the joy they bring? Canine and Feline Health Studies. Price $29.95 Florida Residents. Add 7% Sales Tax FREE SHIPPING! Quantity discounts offered for ten (10) or more. Contact me for pricing.